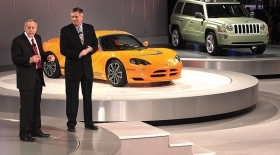 Chrysler LLC co-President Jim Press, left, and Frank Klegon, head of product development, showed the Dodge Circuit EV at the Detroit auto show. DETROIT — Chrysler LLC showed five electric-drive concept vehicles here at the auto show, but the struggling automaker faces obstacles in meeting its goal to bring one into production late next year. Unlike General Motors, which announced a battery supplier deal at the Detroit show last week, Chrysler has not confirmed its battery source or details about other suppliers. All five concepts have lithium ion batteries. Chrysler has not set a production date. Lou Rhodes, president of Chrysler's ENVI electric-vehicle division, says Chrysler already has decided which one of the five vehicles it will make next year, but he declined to identify it. "The design freeze is there," Rhodes says. At the show, Chrysler introduced plug-in versions of the Chrysler Town & Country minivan, the Jeep Wrangler Unlimited and the Jeep Patriot. Chrysler also showed the Dodge Circuit EV, an all-electric sports car developed with Lotus; and the Chrysler 200C, a plug-in electric mid-sized, rear-drive sedan concept. Chrysler is testing 100 plug-in hybrids in commercial fleets this year and plans to launch one late next year. Rhodes says Chrysler would choose a battery supplier based on a number of factors. The company prefers a supplier committed to making batteries in the United States, he says. Chrysler is working with several suppliers including A123 Systems, which supplied the batteries for at least one of the automaker's concept cars. Chrysler sees promise in a sodium-lithium battery developed by General Electric, Rhodes says. Chrysler LLC and General Electric have been selected to compete for a U.S. Department of Energy grant to test the battery, but the funds have not been approved. "Our goal is to work with GE to explore dual-battery-pack solutions based on GE's unique technology, in addition to a single-chemistry lithium ion pack," Chrysler said in a statement. Aaron Bragman, an analyst for Global Insight, says Chrysler's challenges relate more to its future as a viable company than its ability to master the technology. "Will we ever see these vehicles? Yeah, I think we will," Bragman says. "Whether they're part of an independent Chrysler is unlikely. There is value in these vehicles. "The issue is not even what they've got coming in 2010; there's a question they can even make it past 2009. I don't understand how they can continue." If Chrysler chooses to use a 200-kilowatt electric motor, the market price will be prohibitive because the technology is "extremely expensive," Bragman says. "We're talking Tesla-type prices — $108,000 — for a minivan." 1. Chrysler 200C. The automaker stunned journalists by showing the 200C, a concept version of a next-generation mid-sized sedan. The 200C is powered by a 200-kilowatt (268-hp) electric motor with a small gasoline engine to extend its range to up to 400 miles. The 200C, built on a rear-drive platform, shows Chrysler's thinking on a next-generation mid-sized car. As the most recent ENVI concept, the car also has the most advanced technology, including the latest version of Chrysler's uconnect interactive communication system. 2. Dodge Circuit EV. The Circuit EV is a new version of an all-electric sports car first shown by Dodge in September. The Circuit EV is powered by the same 200-kilowatt electric motor as the 200C. Chrysler developed the Circuit EV in partnership with Lotus Group, the English sports car maker and engineering house. The show car looks more Dodge-like than the thinly disguised Dodge EV shown in September. 3. Chrysler Town & Country EV. The Town & Country also is powered by the 200-kilowatt electric motor, coupled with a small gasoline engine to extend the minivan's range to 400 miles. 4. Jeep Wrangler Unlimited EV. The Wrangler EV is a rear-wheel-drive-only version of a stock Wrangler Unlimited with the same electric powertrain as the Chrysler 200C and Town & Country EVs. Chrysler's ENVI group is studying a four-wheel-drive version with in-wheel electric motors, which would eliminate the need for a heavy transfer case. Global Insight's Bragman says the real future possibilities of the gasoline-electric Wrangler lie in having individual motors at all wheels. With individual motors, he says: "You save a lot of weight. You need that range extender, because you won't find a power plug in the woods." 5. Jeep Patriot EV. This is the first time Chrysler has shown the Patriot EV compact crossover. The Patriot EV has front-wheel drive and is powered by a 150-kilowatt (200-hp) electric motor.